When staging a home, think minimize, minimize, minimize. While this is so important in clearing out the clutter, there needs to be a balance in layering. Too simple and the home looks cold and uninviting. By balancing the act of simplifying with the art of layering, the home will feel clean, warm and inviting. Pieces of decor make or break the vibe of the room. Your eye goes immediately to what attracts you most. Buyer’s today are more trendy and modern with what they seek in home buying. At Nyssa Smith & Co. we strive to go above and beyond by staging our listings perfectly in order to attract buyers instantly. Every detail is strategically planned from the curtains to the last piece of art. In this particular setting, we chose to make the room style a bit eclectic and contemporary. The pinks, the yellows and whites all came together with pops of blue. 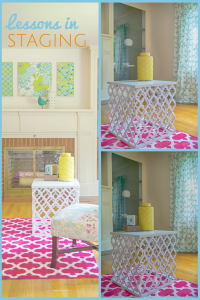 Starting with the trendy Trellis pattern popular today, notice how we layered in complementary pieces. We removed all the nicknacks and collectables in the glass-enclosed shelving that flanked the fireplace and replaced with simple key pieces to complement the room versus distracting a buyer’s eyes. In learning how to layer, notice the difference in the top photo versus the bottom photo. While simplicity is important in staging a home for sale, the top photo just doesn’t cut it. It’s too simple and doesn’t look right. Tastefully layer in just a few pieces to complete your look. And Voilà! You’re done! It’s complete! Now go sell that house quickly for top dollar!